Once the design concept and ideas have been discussed with the client, the process for generating print and packaging work from start to finish is comprised of 3 stages. A range of styles are employed to express different visual interpretations of a specific word or phrase. Done in black and white, then scanned, these sketches can be used for preliminary design concepts and presentations. Once the client chooses one of the preliminary sketches the design is refined to fit the client’s needs until we get it just right. The final phase includes a digital, high resolution, black and white scan done in Photoshop. Klutz Press is a leading publisher of fun, how-to books for children. 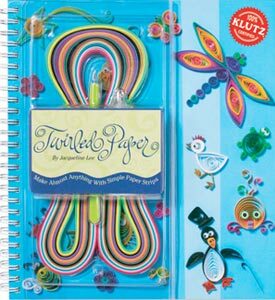 They contacted me when they were designing a new book called Twirled Paper. The idea was to show kids how to make different objects like animals, flowers, fruits, etc., out of thin, multi-colored paper strips. I was given photos of the finished pieces and asked to create a whimsical and easy-to-read title for the book. With pointed pen and brush, I played off of the curled coils of the paper, and created these friendly, lively interpretations of the title. 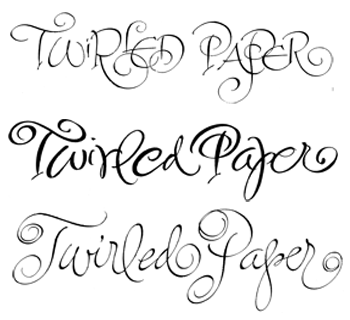 Formed out of both upper and lower case letters, in varying sizes, the title has the quality of "dancing" along the baseline. Although one sketch is bolder than the others, they all express whimsical and informal lettering, employing both script and printing. By repeating the concentric twirl pattern throughout the word, the overall effect mimics how the paper appears when it is twirled. Having chosen this design, Klutz asked me to make the lettering much heavier, change the i-dot into a coil, and form the coils on the capital P and "r" in the word Paper into more pleasing shapes. Here is how the calligraphy appeared in the final printing of the book.